This evening ensemble comprises a sleeveless dress and matching cape. It represents several aspects of the work of the Spanish couturier, Cristóbal Balenciaga, who was active in Paris from 1937 till his retirement in 1968, only a year after the outfit was made for his faithful client, Mrs Loel Guinness. Firstly, it relies on deep knowledge of the sculptural possibilities of certain firm textiles, and on letting the textile determine the cut of the garments. Balenciaga worked with the Swiss textile manufacturer Abraham in creating this fabric, silk gazar. Secondly, it typifies the increasing simplicity and abstraction of his designs from the early 1960s onwards when applied decoration began to play a lesser role than dramatic shapes. Thirdly, it reveals familiarity with the austere quotidian dress of the Catholic clergy (mantle and soutane). The area of Spain from which Balenciaga came was densely populated by such figures clad in black – and the colour, layered effect, circular and tubular shapes relate closely to their garb. In other respects it is entirely modern. 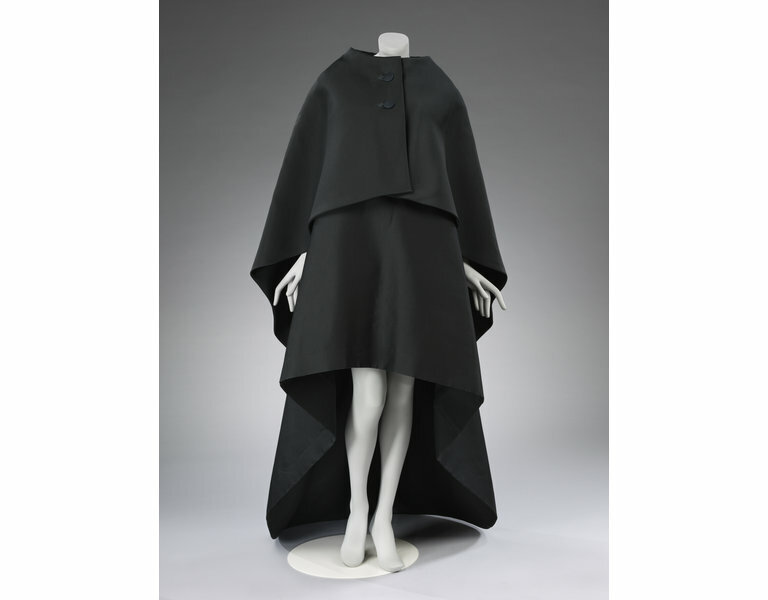 Evening ensemble consisting of black gazar silk dress and cape. The evening dress and gown belonged to Mrs Loel Guinness. She was one of Balenciaga's favourite customers. Its Beaton catalogue number is 27. Historical significance: Signifcant as one of the most austerely aesetic of Balenciaga's 1960s creations, for his use of the textile he developed in conjunction with the manufacturer Abraham of Zurich, for its known provenance. 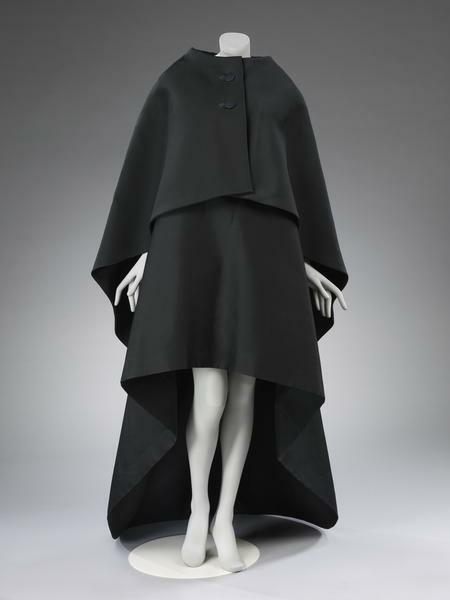 Balenciaga took much of his inspiration for his designs from his native Spain, particularly with this ensemble in its use of black and reminiscence of religious garments. 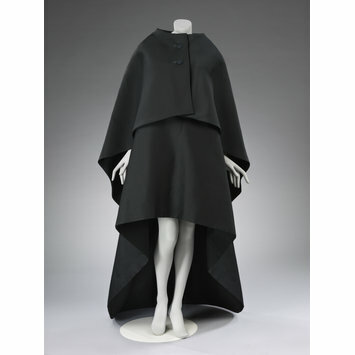 Evening ensemble consisting of gazar silk dress and cape, designed by Cristóbal Balenciaga, Paris, spring/summer 1967. Lesley Ellis Miller, Cristobal Balenciaga. The Couturiers' Couturier, forthcoming London: V&A publications, 2007, Conclusion. The stiff woven fabric is vital to the success of this sculptural dress. Its appearance - a simple, slightly glistening cone - belies its ingenious cut and construction. The garment has been cut in one piece with three main seams - two short ones at the shoulders and one long one down the centre back. The boat neckline, which is scooped out at the back, fastens at the left shoulder with hooks and eyes. Dipping hemlines have long occupied designers and in this case maximum contrast is achieved by a knee height at the front and a ground trailing level at the back. Thus we have the best of both worlds, from one angle, a petite black dress, from another an impressively trained gown. The curved and weighted hem has a wide self-binding (seamed at regular points) and the train has a deep facing which adds to the rigidity of the dress. It was originally worn under a shorter cape in the same fabric which buttons at the front and echoes the clean and dramatic flared lines.